Yes you can still have Curry on the low FODMAP diet….well if you cook this you can! This rejigged classic Curry recipe is healthy and low in FODMAP’s with a few separate process which all combine into one amazing dish. Start by cooking the rice and keep warm once cooked. Heat the oil in a large pan over a medium heat. Add the bay leaves and fry for 20-30 seconds. Add the green chillies, sugar and green beans and continue to fry for 4-5 minutes. Meanwhile, blend the ginger, coriander and tomatoes to a smooth paste in the food processor. Season with the salt & pepper. Add the paste to the green beans and heat for 2 minutes………..
…………..then put in the chicken pieces and stir well to combine. Simmer for 5 minutes, stirring regularly. Add the yoghurt, stir well and continue to simmer the mixture until the sauce has thickened; estimate 5 minutes. Stir in the spinach purée and continue to simmer for a further 5 minutes. If needed season, to taste, with salt and freshly ground black pepper, then serve with rice. Tip: I much prefer chicken thighs / drumsticks poached and the meat removed to cook in recipes like this, i.e. rather than cooking them as a part of the meal cooking them before and adding them in. The meat is just really nice and tender when cooked this way and saves all the marinating rigmarole which is traditionally used as part of great Curry cooking. You can also use left over roast chicken. Place the 8 chicken drumsticks in a big pan, just cover the chicken with water and bring to the boil. Turn the heat down as low it will go and continue to poach the chicken for up to 20 minutes (lid on). Remove the chicken pieces and let them cool down, BUT keep the water, then tear all the meat off, which takes a little while and gets your hands messy but means the chicken will be succulent and moist. Keep the chicken in the fridge until needed. Extra Tip: Low FODMAP Chicken Stock! Of course another great benefit of doing this is you can now make lovely home-made chicken stock out of the drumstick bones and cartilage. Use the water you used to poach the chicken and add some celery (no more than 5cm in length), whole black peppercorns, carrot, salt, a bay leaf or other herb, star anise if you like, and simmer for a few hours (take the lid off after a couple of hours to help reduce the liquid). Or until reduced to at about 200- 300mls stock. When you pour it into a measuring jug use a sieve. Finally cover and let the stock cool and solidify overnight, then remove the top layer of fat and put the rest of the jelly like substance into an ice cube tray and freeze until needed. 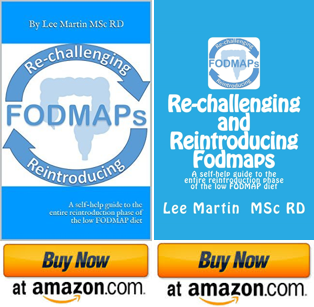 Want more information on the low FODMAP diet and IBS / functional bowel disorders? You had better click here. Or for dietitian approved low FODMAP recipes see here. Hi Andrea-Elena well spotted! We used some pre-boiled potatoes and just added them at the point shown in the photo. The green beans were fresh – well as fresh as is possible after travelling from Kenya to the UK and sold in a supermarket!